We are great fans of Garden Sheds at DIY Doctor, and we always follow the progress of the Shed of the Year Awards, which is an annual award run by Readers Sheds for any shed owner in the UK to enter. This year’s Winner is a fine example of the genre, it is a beautiful boat-roofed shed set in rural Machynlleth, and made entirely from recycled materials. The competition is sponsored by Cuprinol and all the sheds entered into the competition were judged by an esteemed panel of industry experts including Channel 4’s Sarah Beeny, Presenter Kevin McCloud, Uncle Wilco who founded the Shed of the Year, plus last year’s, Shed of the Year winner, John Plumridge. 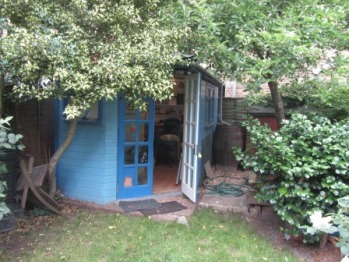 See all the Shed of the Year finalists on Readers Shed’s Shedblog and see whether you think the judges got it right. We are quite partial to the ‘Tardis’ Shed, perhaps it is the ‘Doctor’ in us! If you would like to create your own winning entry for next year we have DIY Projects on How To Lay a Shed Base and How To Build Sheds on DIY Doctor’s main website, and we would love to see your sheds if you want to share your pictures with us, simply contact us and send us your pictures. If you fancy showing off to a wider audience DIY Doctor has a Shed and Treehouse Pinterest board with some of our personal favourites, and we will happily share you achievements with the world! Charles and Charlotte from DIY Doctor share this home office shed (below) – we would love to know, what do you do in your sheds?